Dogs can drive cars! You heard it and it is not a joke, they really can. 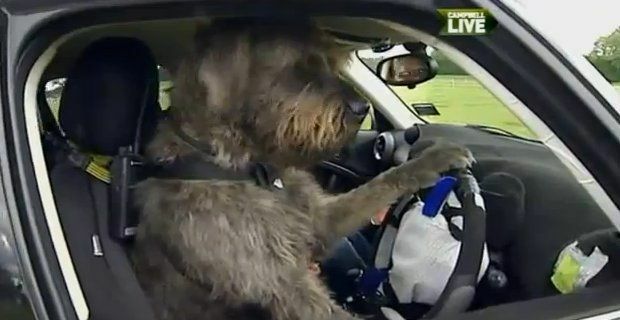 A group of campaigners for the New Zealand Society for the Prevention of Cruelty to Animals (SPCA) is teaching three dogs how to drive, and by watching the video, they seem to enjoy learning it. Although the images might put a smile on our faces, the message behind this project is very serious. The three dogs are learning to drive in an attempt to change the public's perception on their intelligence and to increase their chances of being adopted. The SPCA team came up with this bizarre idea to prevent dogs like Monty, the giant schnauzer, being abandoned. His owners gave him up, because they had serious difficulties in controlling his behaviour. However, since the dog was rescued by the campaigners six months ago, his attitude has completely changed. After undergoing a thorough daily training, the canine has even managed to learn how to hold a steering wheel and to change gear. Other two furry friends, Ginny the whippet cross and Porter the old mutt, are also putting their driving skills to test, in a bid to earn a home for themselves and for other unfortunate dogs. It took more than seven weeks for the animal trainers to teach the tricky skills: the three dogs started with simple tasks like pressing buttons, then they learnt pushing levers, and finally they've been put behind the wheel of a real car to practise steering. The heart warming initiative has found support in major sponsors, such as Mini, which provided the vehicle for the training and will also be broadcasted live on a New Zealand network. The charity hopes that by viewing the unique performance of these clever pets, the public could change their opinion on cruelty and abandonment to animals. Even if they don't succeed, they've already won our hearts! The latest Mini Cooper cars are wowing everybody!